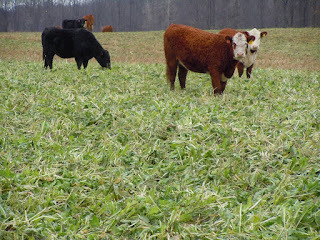 Photo 1: Forage cover crops have the potential to reduce feed costs. Photo: Eric Mousel. Now is the prime time to be seeding small grain stubble fields with a cover crop to be grazed this fall, winter or next spring. One of the many benefits of incorporating small grains into the crop rotation is the ability to get a forage cover crop established by the end of August, which is a great way for beef and dairy producers to add value to their crop fields by extending the grazing window or adding to the forage supply. The amount of forage produced by cover crops will vary widely depending on establishment success, precipitation, and growing degree-day accumulation from seeding to harvest. There are a number of cover crops well-suited for livestock grazing or mechanical forage harvesting. Some crops work better than others depending on your specific objectives and field scenarios. Before selecting cover crop species, determine what you want from the crop. Do you want to graze or harvest the forage this fall, next spring, or both? What is more important, forage yield or forage quality? Are you planning to graze the cover crop or chop it as haylage? Do you want the crop to winterkill or to regrow next spring? How much are you willing to spend on seed? Are there grazing restrictions for herbicides applied earlier in the year? These are all questions that need to be addressed when selecting species or species mixtures. There are several great resources available online to help make your decision easier. Oats and brassica species alone or in combination are likely some of the best options for fall grazing in Minnesota. University of Wisconsin research has found that fall-grazed oats can produce from 1 – 4 tons of dry matter (TDM) per acre when seeded by mid-August and grazed by mid-November. When brassica species are seeded and grazed on a similar timeline, they have the potential to produce 1 – 2.5 TDM per acre according to research conducted in Minnesota and Michigan. Berseem clover and crimson clover are forage legumes that can produce from 1 – 2 TDM per acre, and can be seeded alone or in combination with a cereal crop to improve forage quality. A benefit of seeding summer annual cover crops for fall forage is that these species generally winterkill in Minnesota and require less management the following spring. If you plan to bale the cover crop for baleage or dry hay, you may want to exclude brassica species from the mixture as they are not very suitable for baling. Cereal crops best suited for grazing next spring include cereal rye, triticale, or winter wheat. Winter cereal crops have the potential to produce 1 – 4 TDM per acre by mid-May, and can be grazed or mechanically harvested for forage. As the winter cereal crops mature in the spring, forage quality will diminish as biomass accumulates. If significant biomass accumulates this fall, winter cereal crops may be grazed this fall without dramatically increasing the risk of winterkill. However, at least 4 to 6 inches of stubble should be left to maintain the probability of winter survival. Will grazing cover crops improve my bottom line? Seeding a forage cover crop to graze or harvest will most likely provide a positive return on your investment, but has the potential to vary widely based on seeding costs, biomass production, and weather. The additional complexity cover crops add to the cropping system can cause problems with insects or diseases in subsequent crops, and requires additional labor to manage. Minnesota has an average wintering cost of $65 per cow per month for beef cows. Grazing cover crops has the potential to produce several tons of dry matter per acre of fall and early spring grazing, allowing cows to stay grazing longer in the fall and earlier in the spring. Research conducted in eastern South Dakota has shown that cover crop grazing mixes can feed a cow for $10 - $40 per month; a savings of $25 - $55 per cow per month over traditional feed rations (Table 1). Table 1. Average dry matter yield (tons/acre), cost per acre ($), cost per ton ($), and cost per cow per month ($) for 4 different cover crop grazing mixes seeded following cereal oat harvest in mid-July. Angus X pairs grazed cover crops for 60 days starting in early October. Grazing cover crops can provide other benefits as well, such as additional time for permanent pastures to recover, allowing calving on pasture rather than in a dry lot, and can reduce manure hauling costs. Every farm is different, so creating a cover crop plan that meets your needs is key to success. If you are interested in incorporating cover crops into your forage supply, start small and determine what works best on your operation. Ackroyd, VJ (2015) The use of fall-planted brassicaceae cover crop mono-and bi-cultures for nutrient cycling and weed suppression. PhD Dissertation, Michigan State University. Grev, AM, CC Sheaffer, ML DeBoer, DN Catalano, KL Martinson (2017) Preference, yield, and forage nutritive value of annual grasses under horse grazing. Agron. J. 109:1-12.